Minimum is a new shooter brought to us by Human Head Studios. 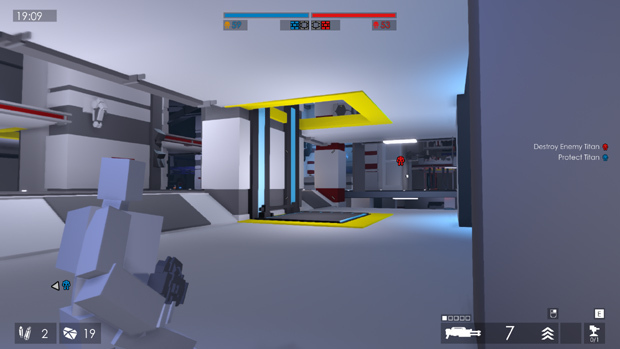 Living up to its name, the game has a unique “minimal” art style that features a lot of block-based shapes and few colors. It also features crafting, customization, and fast-paced shooter action. Just about everything that’s needed for a fun time, right? Minimum is currently in Early Access on Steam, and this is written based on my experience playing the game in its early stages. The first thing that stands out when you look at Minimum is the graphics. They aren’t the most detailed in the world but, oddly enough, that’s part of the charm. The simple shapes and colors come together in an eye-pleasing manner. I was surprised to find just how awesome the weapons look, despite how blocky they are. Especially the katanas – as they evolve throughout a match, they continue to become something amazing to look at. I’ll keep things as simple as the graphics – the game looks great. For now, you don’t get much chance to customize the looks of your block-dude. Some of the screenshots I’ve seen suggest there will be more stuff to fiddle with in the future, but not yet. For now, most of your customization will come, at least in a pre-game sense, from fine-tuning your load-outs. 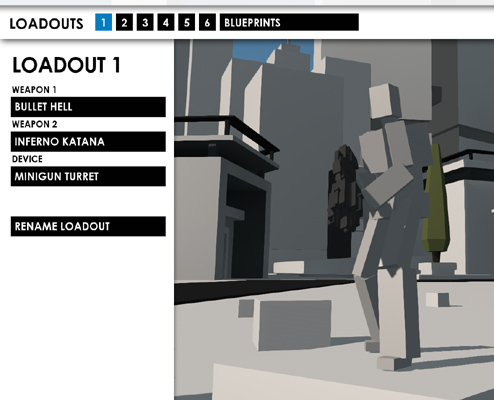 The load-out system is typical of a shooter – you choose a primary weapon, a secondary weapon, and some gadgets (deployable turrets, grenades, that sort of stuff). Basically all you could really want in a load-out. Besides the load-outs, once you’re actually in the game you get a bit more customization. For now, there are only two armor sets in the game, and you can’t do much of the stuff they have planned for the future (such as more deployables and structures). 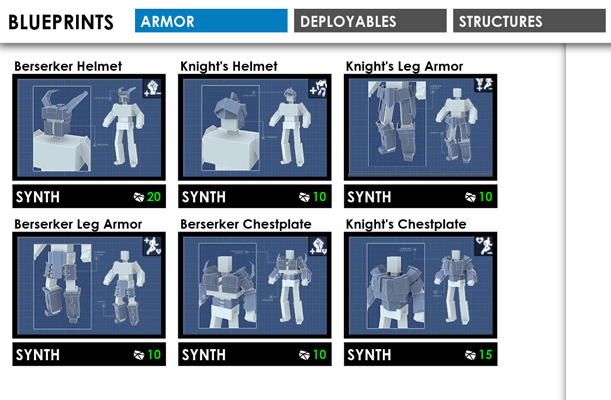 Of the two armor sets, you can choose from Knight and Berserker. As you kill opponents, you gain a special kind of currency which is used to purchase and upgrade these armor sets, piece by piece. In short, when the match starts you’re going to be naked, as it progresses you’ll notice yourself and others getting bits and pieces of various armors, and (if all goes well) towards the end of the match you’ll have a full suit to work with. Usually, when a game is this early in development, the controls are one of the first things you will notice that need improved. I was surprised to find that was not the case in Minimum. Right from the start the controls felt smooth and responsive. You’re even given a fair amount of choice when it comes to fine-tuning the controls and key-bindings to your taste. I’m glad the game controls were so smooth, as they are usually what makes-or-breaks a game for me. As with everything else, the gameplay in Minimum is quite simple. So far as I know, there are three planned game modes, with only one available at the moment (but the rest should be out fairly soon). 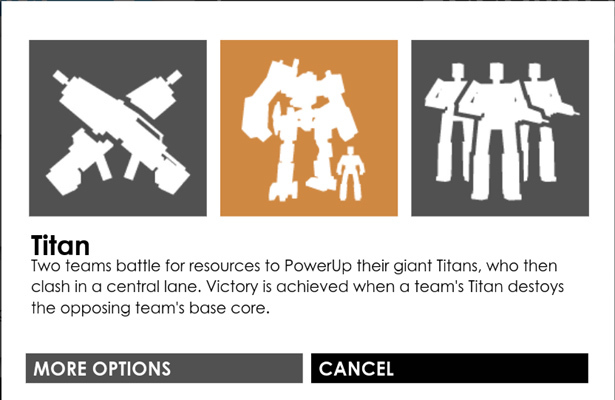 Right now, the Titan gamemode is the only mode available. The other modes will be Team Death Match and Dungeon Crawl. I’m personally looking forward to Dungeon Crawl, as it seems like it will be interesting. So far, the only mode I’ve been able to play is Titan. 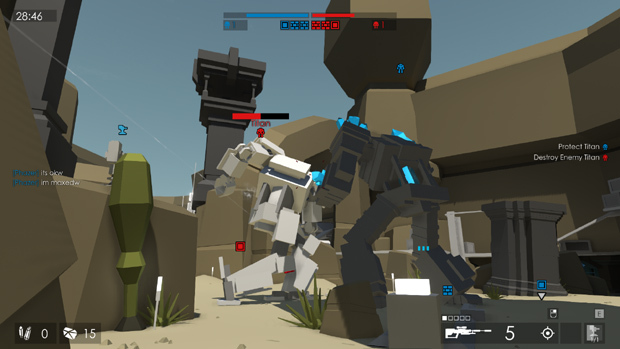 In this game mode, each team has a giant Titan that walks along a linear path in an attempt to get to the enemy base and destroy it. It is the job of the teams to assist and protect their own Titan, while they try to hinder or destroy the enemies. Mixed with deployables, this mode actually feels kind of like a tower defense game mixed with a Team Death Match shooter. And, while it is quite fun, I have to complain that the matches seem to be quite short. Hopefully the devs will change things around later on to make them last a bit longer. The combat in Minimum is very fast-paced. You’ll need to be moving constantly if you want to stay alive. 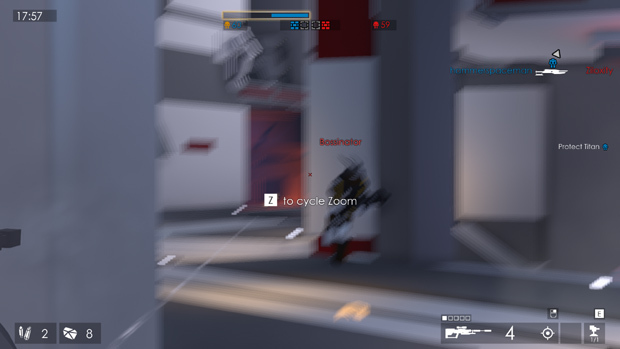 This is one of the few games where I actually enjoy having motion blur on. Usually I can’t stand it, but I found the experience much improved in Minimum, especially while in the middle of a full-team fire-fight when there are explosions and bullets going everywhere and people with flaming katanas sprinting around. If it’s this fun right now, I can’t wait to see how things are later down the line. As you might imagine, it’s hard to convey how good the motion-blur is in a screenshot. As I mentioned, deployables are a thing. There are also structures, but they’re not yet in the game. 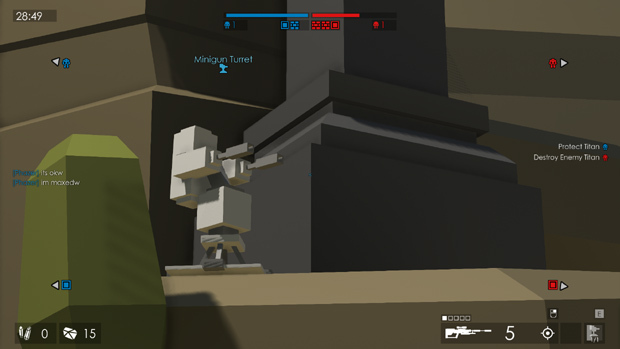 Right now, there are three types of turrets, including a flamer and a regular mini-gun turret. Making use of these turrets is a great way to turn key-locations into kill-nest, allowing you to farm up parts for upgrades. They’re also a decent way to watch your back while you’re trying to snipe, although in that case they’re better as an early-alarm system to tell when someone shows up behind you rather than actually being useful. 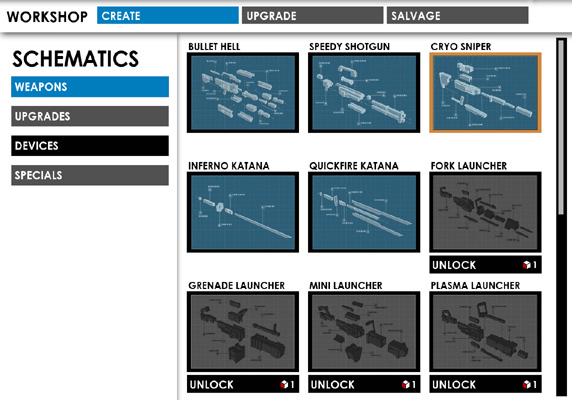 You can gain schematics, which you can then use to create new weapons and deployables to add to your loadouts. At the end of each match, you’re given resources that can be used to craft these schematics. The system is prettying interesting and gives a sense of progression. My only worry is that it may make it harder for newbies to get into the game if they’re contending with decked out players. It’s a nice system overall, though, and I can’t wait to see it fleshed out more. Minimum is an interesting game so far and should evolve into something magnificent as time goes on and development continues. The combat was quite nice, even with motion-blur enabled. The crafting system is interesting, but I’m worried about how it’ll affect gameplay for newbies. The game seems surprisingly polished for an alpha game, and it seems like right now all the developers have to worry about is adding features and tweaking things. If you’re looking for a new third-person shooter with a unique art-style and fun gameplay, check out Minimum on Steam Early Access. Be sure to keep an eye on this one. Along with the launch of Alpha 5, Supernova welcomes back returning commander Nyx.